In the American South, a New Year’s Day meal of black-eyed peas and greens, such as collards, is considered good luck. The peas symbolize coins and the greens symbolize paper money. A dish that combines both is the popular beans-and-rice combination, Hoppin’ John. Other favorites are black-eyed peas and ham, the peas often combined with collards (photo #3). The custom is actually a lot older than the U.S., and began in the Middle East. Here’s the history of black-eyed peas as a good-luck food. They have been cultivated since prehistoric times in China and India. The ancient Greeks and Romans preferred them to chickpeas. They were brought to the West Indies from West Africa by slaves. The earliest records cite 1674. In the New World, they became a staple of the slaves’ diet, and were also used as food for livestock. During the Civil War, black-eyed peas and corn were thus ignored by Sherman’s troops, who burned the food crops to the ground so the locals would starve (and made off with all the livestock). Left behind in the fields, black-eyed peas and corn became critically important food for the Confederate South. WHY ARE THEY CALLED PEAS? Black-eyed peas are clearly beans, so why are they called peas? Pea plants (genus/species Pisum sativum) have hollow stems; beans (genus/species Cicer arietinum) have solid stems. Peas have leaf tendrils which they use to twine. In general, beans lack tendrils. The taller varieties of both peas and beans need trellises to support them as they grow. 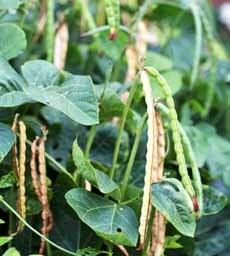 Most beans just twine themselves over their supports, while peas use their tendrils to climb. At each node along their stems, peas generate two or three one-inch-long tendrils, which grab and then wind themselves around something, such as a narrow trellis. If you’re still curious, here’s more on the differences. 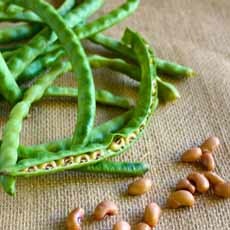 Bean is a term loosely applied to any legume whose seeds or pods are eaten. 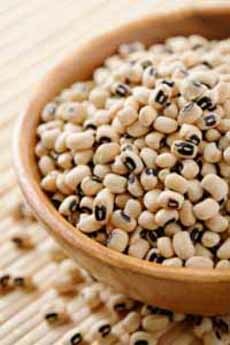 Black-eyed peas are in the bean genus, not the pea genus; but in the old days, most farmers didn’t know the difference. Other beans popularly called “peas” are the chickpea and the pigeon pea. There are endless recipes online; typically sides (with or without greens), green salads and bean salads. Black-eyed peas, which are beans. Depending on the variety, the beige color ranges from off-white to light tan (photo by Viktor Lugovskoy| IST ). Growing on the vine (photo courtesy Jesus Jazz Buddhism). In and out of the pod (photo courtesy Cheryl D. Lee | Zester Daily). If you search for “black-eyed peas” online, the first zillion pages are for the music group called Black Eyed Peas (no hyphen). We like the group, but they cause us to refine our search to black-eyed peas bean, food, etc. The search-hogging band originally incarnated as rap group, Atban Klann; then Black Eyed Pods; and then the Black Eyed Peas.